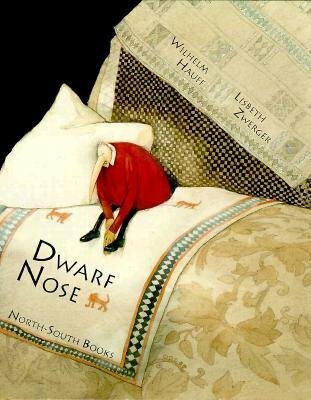 One of the most memorable bed time stories I’ve heard that has stuck with me throughout the years is Dwarf Nose (Karlik Nos in Russian) by Wilhelm Hauff. A young boy works at a market helping his mother sell herbs. One day an old and ugly woman with a giant nose comes sniffing around their booth. The boy is rude to her, poking fun at her disfigured nose, so she requests his help carrying her herbs home across town. There she makes him a soup that knocks him out for seven years. He dreams about turning into a master chef servant squirrel, and wakes up seven years later as a midget with a long nose. Imagine that. He runs back to the market and finds his mother who of course doesn’t recognize him and shooes him off when he claims to be her lost son. He then goes to his leatherworker father who tells him the story of the long-lost son while offering to make a leather case for the midget’s horrid nose. The boy then shuffles off to the nearby castle and goes to work for the duke as a master chef, earning respect for his talent regardless of his disfigurement. One day he goes to the market to buy geese for the kitchen, and one of the flock starts to speak to him, informing him that she is actually the daughter of a powerful wizard and can help him reverse the spell. They run away from the castle, find some rare herbs that turn them back to their normal selves, and all ends well. Cute, huh? I would love to see this turned into an opera.